you name it, we’ll work with it. 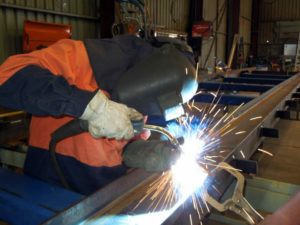 More than just a job shop, David West Welding & Fabrication can be your partner in product development and production. We have a reputation for our meticulous quality standards, and we follow stringent safety practices in all our work. Our production capabilities are unmatched for major residential projects. We’re ready to provide expert design and execution on architectural details, such as railings, gates, stairways, ornamental fencing, or estate signage. If you’re a contractor or homebuilder with a project that calls for the strength, durability, or unique aesthetic qualities of solid metal components, please give us a call. Our extensive experience in custom metal fabrication gives us a solid familiarity with many different applications and challenges of metal work. Plus our mobile welding capabilities enable us to bring our expertise directly to the worksite when it’s not feasible to use our shop. Plus a full spectrum of metalworking services from cutting and bending to welding and assembly…all performed with precision craftsmanship. We’re ready to assist with everything from prototyping to moderate-volume production work.